Dickins spends five minutes with Miles Allen on one-man Breaking Bad! BlogPostsFamous FacesDickins spends five minutes with Miles Allen on One Man Breaking Bad! Dickins spends five minutes with Miles Allen on One Man Breaking Bad! One Man Breaking Bad is critically acclaimed and extremely popular! The Edinburgh Fringe Festival attracts some of the best performances and shows in the world. 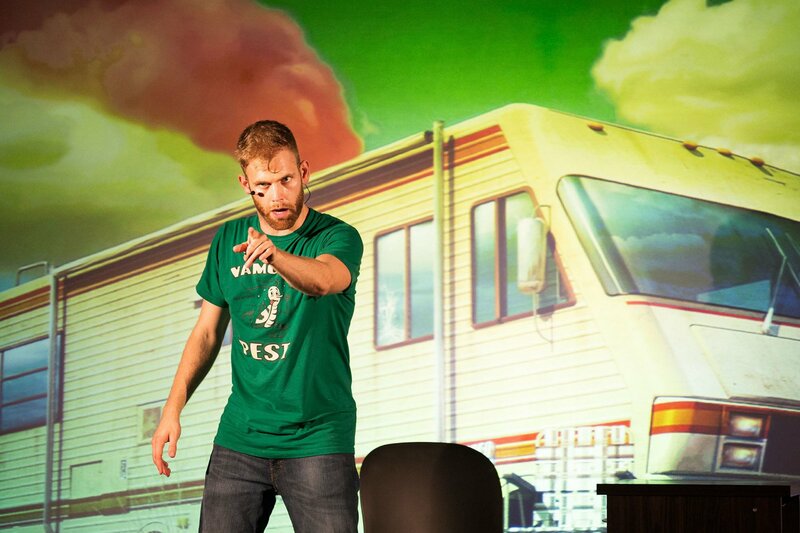 Dickins spent five minutes with Miles Allen on One Man Breaking Bad – his critically acclaimed Edinburgh Fringe Festival show. Miles Allen and One Man Breaking Bad! Miles Allan’s One Man Breaking Bad took the Festival by storm last year! 1. Tell us about your Edinburgh show this year? Miles: One Man Breaking Bad returns to the fringe entirely revamped with new jokes, louder laughs, and more meth! Come out to see me reenact the best TV series of all time in a hilarious one-hour show! Miles: This will be my second year bring the Meth Lab to the Fringe! I guess they liked the “product” I brought last year, and I always leave the audience wanting more. Miles: The fringe just means a large smorgasbord of talent, that can wet anyone’s tastes and appetites! Also…Deep-fried Mars Bars! 4. Do you have any favourite Edinburgh hangouts or regular haunts? Miles: LOOOVE the Castle. It was the first castle I ever saw in person, and being from America, I thought it was the most epic thing I’ve ever seen! I think may try to conquer it this year…turn it into a meth lab probably! When and where can you see Miles Allen’s One Man Breaking Bad? Click here to buy Miles Allen’s One man Breaking Bad tickets! Make sure to get the perfect apartment for your Edinburgh Festival experience!